What a ride. 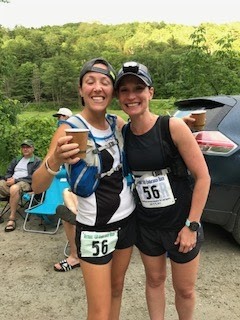 July 15-16 the Vermont 100 miler. Finishing in 23:41:47 earning the big buckle. A sub 24 hour finish was my B goal. Back up a bit. The previous weekend is when the whirlwind trip started. I first got up well before the sun and headed to a local race where I had 9 clients racing. It was amazing to watch them in the distances from the 1/2 marathon to the 50K all on the trail. I ran the 50 mile at this race last year as a tune-up and practice race with my pacer for Leadville. A little part of me wanted to be racing, but knowing that in a few hours we would be in a car driving across the country, would probably be a bad idea. We left around 5pm Saturday. Stopped along the way in Indiana, I think. We then stayed at a state park near Lake Erie the next night. We were so close to Niagara Falls that we decided to make the trip. We had my 13 year old daughter with us and she had never seen it. It was pretty cool to walk right out to the Horseshoe Falls on the USA side. We arrive in Vermont late night Monday and set up camp in the dark. Oh did I mention that we camped the whole time?! We stayed at Mt. 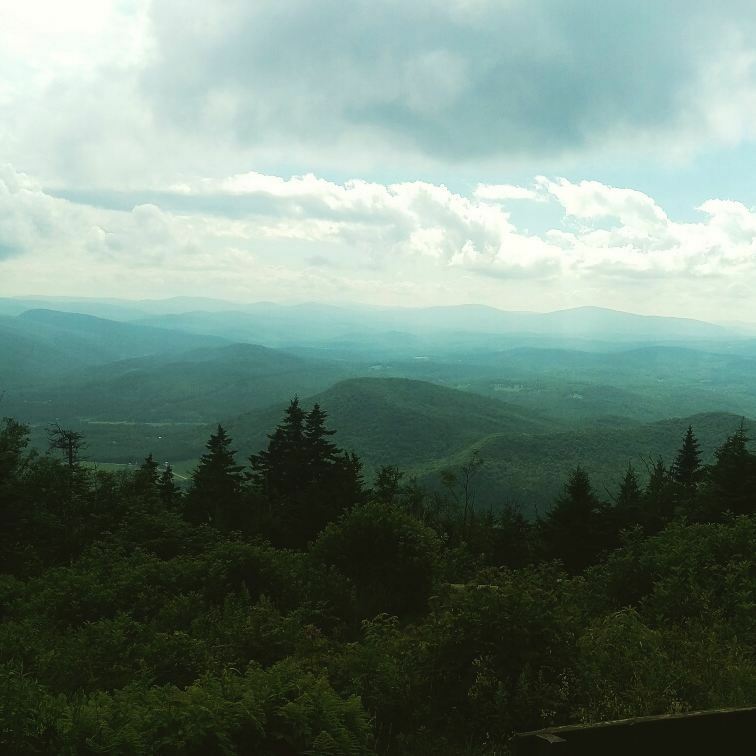 Ascutney State Park, which was only about 30 min away from the race start/finish. We decided to climb the mountain on Tuesday, that was as close to race day that I wanted to do any hard effort running. It was 4.5 miles to the summit and almost 3,000ft of elevation, Roubaix and I took 2.5 hours I think to get to the top. The view was worth it though. My quads were sore until Friday though from the downhill. It was so steep that you couldn’t even walk it. I should have realized that this is Vermont and it was a preview to what was coming. Friday, the day before. I went to the start/finish area at 10am to check in and pick up my race bib and get weighed. 11am my girls come to camp to talk race strategy. Laurie my dear friend from Florida made to the trip up to crew. She is a masters track athlete, so the world of trail ultras are another scene. 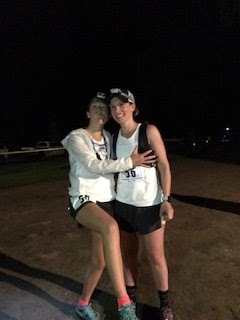 My bestest Jana came from Minnesota to pace me the last 30 miles of the course. That is the earliest point in which they let the pacers join. I had packed my drop bags the night before, showing them which ones I wanted where, was key. We planned for the next morning, they left and I went to sleep. When you plan to be out running for 24+ hours, getting adequate sleep days leading into it are crucial. I woke up around 3pm and we left for the pre-race meeting where i ate the best ice cream waffle cone. 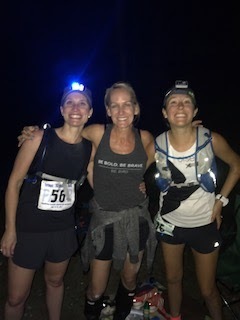 Met up with the girls and listened to all the elements for race day. 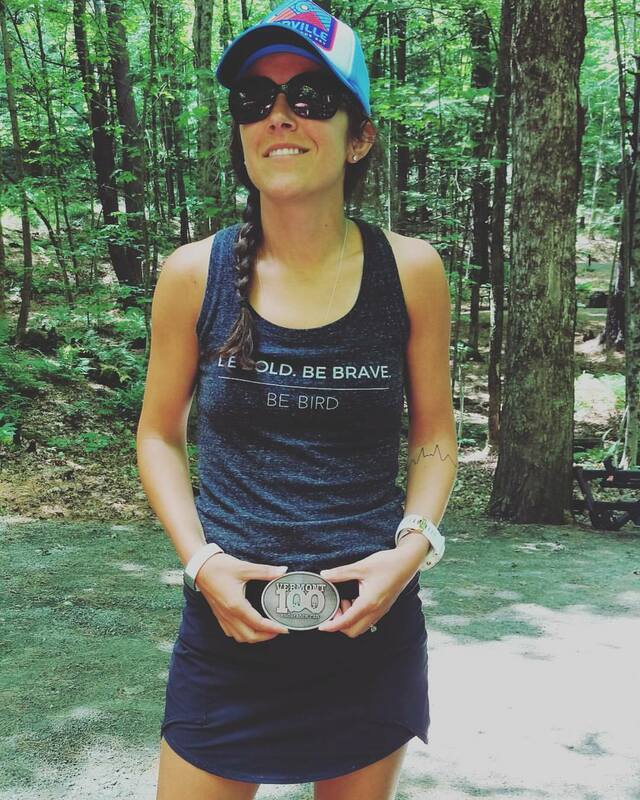 Vermont 100 is the first race in ultra running to have an adaptive category. At least two visually impaired runners were entered into the 100 miler, and at least one physically impaired runner. How amazing! p.s. both the visually impaired runners finished! There is also a endurance horse race that happens simultaneously. They prepped us on how to approach a horse and how to run with them. Saturday morning 2am=wake up call. I wanted to be at the start around 3am for the 4am start time. Yogurt and coffee in the car on the way to the race. Check in again, go to the bathroom, wait. 4am hits and we are off, I had to fight the urge to be out front and stay there. I knew I had a long day ahead of me and I needed to play it safe. We started with a big downhill, not that different from the hill I ran a few days before. Pace felt great, climbs were easier than I thought, because I was having trouble engaging my glutes leading up to the race. These miles went by fast. I ran most of it with a guy named Andrew who recognized my Concept 2 hat. You may have noticed me wearing this hat at many races. It’s my lucky trail hat. This company is based in Vermont, it was a great conversation starter. I felt a bit hesitant wearing it not wanting it to be equivalent to the guy wearing the band t-shirt to the concert. Decided it was a state pride thing. 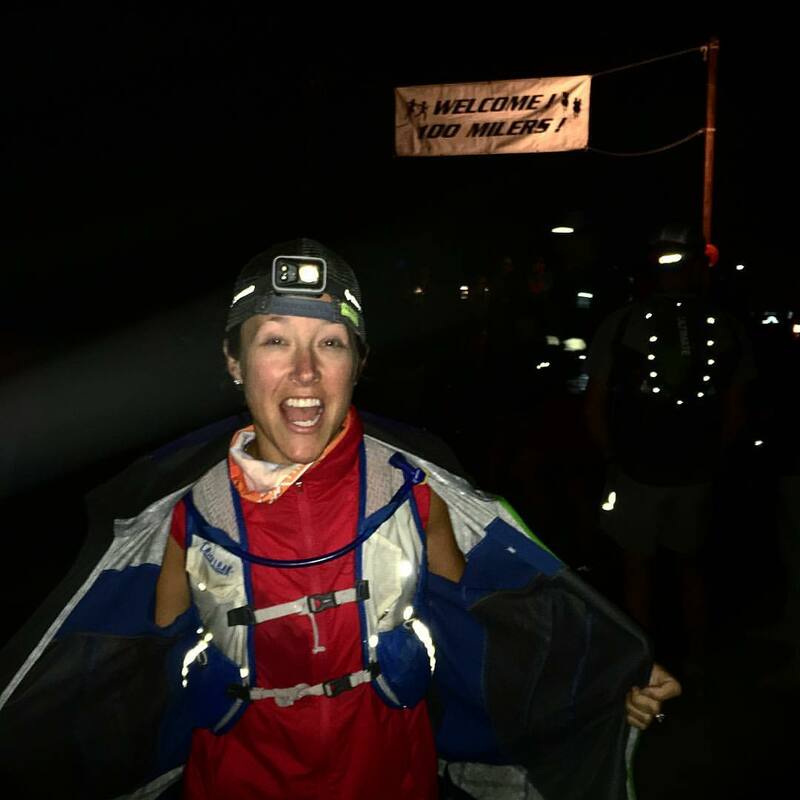 The plan was to meet at the first crew accessible aid station which was 21.3 miles in called Pretty House. My estimated time to arrive was 8:38-9am. I got there at 7:45am, needless to say my crew was not there. I always drop bags even if Roger is there. You never know if something hinders them from showing up, you could be left without your gear. For this race I went against my usual and did NOT drop bags. I was in great spirits, feeling good. I shoved some loose fig newtons in my pack and told some other spectators that if people came in looking for #56 I was going to go to the bathroom and then head out. They caught me just as i was about to leave. I wasted 10 minutes. I would see them again in 9 miles at Stage Road. What happened in those 9 miles, I don’t think I could remember even if it was the day after. Uneventful i guess. I think this when we went through the meadow. The dreaded meadow. It was humid and overcast most of the day, but why did the sun come out just as we were coming through the meadow?! I hate it. I was already fantasizing about jumping in a body of water. I think I lost my shoe in super deep sucky mud in this stretch too. I grabbed an ice bandana when I saw my crew again. I changed socks and shoes. It would be another 16ish miles before seeing them again at Camp 10 Bear the first time. There are, however, aid stations about every 4 miles with water and food, your crew just can’t access them. Those next 11ish miles to the Maragaritaville aid station was a bit brutal. A tad over 50 miles in and my knee was starting to hurt. My knee cap moves when my quads get tight. Remember when I said the downhills were steep? I was being stubborn, me I know, shocking. I didn’t want to take Advil or Tylenol fearing I would upset my stomach. Which looking back I think is a bunch of bs. I have pretty much an iron stomach, It doesn’t get upset, I just don’t want certain foods at a particular point. We all get there. As an ultra-runner I enjoy the pain, invite it even. Will I be a sell-out if I take the Advil and dull that pain that I am inadvertently searching for? I hit a wall, the wheels came off, I crashed from the sugar that I normally never eat and the Popsicles that were delicious. Whatever you want to call it, it happened there. All I wanted to do was sit for a bit. I had come to the realization that all the time I built up running faster than a sub 22 was gone. I think I was dealing with that too. Time goals are tough to let go of. I guess somewhere inside feeling that my A goal was now out of reach, why not make that gap even bigger. I sat for maybe 15 minutes, while my shoes got changed, lube was applied, pack was refilled, food was packed. My crew got me up out of that chair and on my way again with a more padded shoe. give me those Ramen noodles! It was another 11ish miles to Camp 10 Bear again to pick up Jana. Changing into the Hoka tracer helped my sore feet, it prevented them from getting worse. I had some serious chafing on my inner thighs that was caused by the ice bandanna melting and soaking my shirt and shorts. So that was awesome. I tried 3 different lubes. The one from a stranger that you had to apply with a glove and had a creepy baby on the package did the trick. I went from eating salted watermelon to picking the meat and cheese out of pre-made sandwiches and ditching the bread. 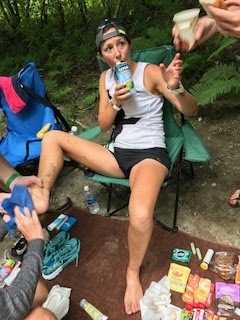 Ramen and coconut water at every aid station. I knew I was slowing, The thought of never finishing didn’t cross my mind. That is not an option, WHEN I crossed that line was now in question. More chatting with strangers and mindless miles passed by just waiting until I can grab Jana. Picking up Jana at mile 69.4 in the daylight was great. However, we started out kinda rough. As soon as you leave Camp 10 Bear the last time you get to so graciously climb for the next 2 miles. I was already feeling worn down, I had a fresh braid from my daughter, a foot rub, and some new fuel but I wasn’t back yet. Add the climb. We had less than 7 miles to get to the next crew spot, so that meant there was at least one aid station in-between. Jana was a breathe of fresh air and she was trying really hard to put some wind back in my sails. She was fresh, fresh legs, fresh eyes, and a fresh attitude. She was seeing this amazing countryside for the first time, she was running with the horses for the first time. In some way I took that all for granted. I had been out there for 15 hours already, I had seen most of it. How that all must have looked to new eyes! I got my ladies with me! The next aid station was a blur and much of the same, a change of socks but not shoes. We were in and out quick. 12 more miles. I was feeling better, the night came and it was beautiful! I made Jana turn off her lamp and stop to look at the stars. With zero light pollution and a perfectly clear night, you could see everything. I haven’t seen the milky way lit up like that in a long time. The course was also marked with green glow sticks hanging from the trees to show you that you were on the right path. These were coined ‘fairy lights’ by Jana. Pretty sure this is the leg I pooped in a field. I got blinded many a time by the knuckle lights that Jana kept swinging around. We get to Bills, the second to last aid station. I got soup and ramen. I was feeling good. I got a nice foot rub, changing socks for the last time. We were so close only 7 miles to the next one and then 5 to the finish. Home stretch, we got this. Also Jana was sweating so much she had to change clothes here. I don’t get it, I had been in the same clothes for a day almost already. Rookie. 12 miles left. I don’t remember much from this section. 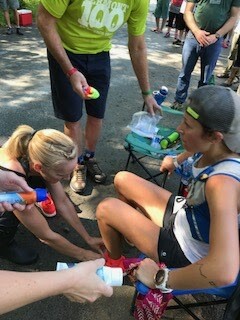 I know I sat down at an aid station to let my feet rest. I know there was some single track that was really hard to maneuver due to not being to bend my knee much. I got blinded by the knuckle light again. As we are approaching the last aid station I look at my watch to see where we are at for time. I see that we have an hour and a half to get sub 24. I thought this goal was gone, I hadn’t paid attention to overall time for almost 30 miles, just the time it took to get from crew station to crew station. A runner ahead of us hears us talking. “are you doing math, you can make it. You need to do a 15 min mile.” We agreed we would stop quick and go. I needed a foot rub. It helped so much before and if I was gonna kick into high gear, I needed it. I had heard the last 3 miles were a B, the last mile especially. Roger knew we were close and had to push. He didn’t want to rub my feet, not wanting to waste anytime that should be used to get to the finish. I convinced him, that in order to get there, I needed it. We decided to go for it, Jana I could tell had been waiting for this. We were running up things we walked previously, we ended up passing about 15 people. We were not going to let the clock win. Every time I envisioned the finish I would get choked up and have to shove it down. Crying and running don’t mix. Jana, if you do not know her is the opposite of me in the crying game. I cry at everything, she cries at nothing. I told her she better cry at the end of this! I only snapped on her once. It was in these miles, it was a shut up or stop it or something. Quickly passed and almost forgotten already. 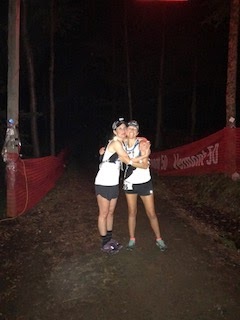 We made it to that finish, those last 5 miles in 56:26, finishing at 3:41am with a total time of 23:41:47. I did it, I didn’t cry though. We had kicked in so much so that our crew wasn’t there. They missed it. 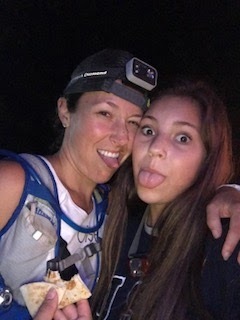 My daughter was disappointed, this was her first 100 mile spectating/crewing experience. It was something special to have here there eager to help, so proud. This is what makes me cry now. The hard work, the long hours, the sacrifices. She sees it firsthand. It pays off. When you spend most of your days in constant conflict with a 13 year old teenage girl and to have them light up at the sight of you while you are just trying to make it from point A to point B. That right there is priceless. I am disappointed in myself for not hitting the A goal of a sub 22 hour finish especially when I was pace for over half the race. I know I can do better. I know it’s there. I ran with multiple people throughout the race, sometimes for hours. You jump right into a seamless unspoken ongoing rhetoric almost immediately. You can talk about hardships and fears, mishaps and DNF’s. All while never exchanging names. These strangers know more about you on a deeper level, names don’t matter, labels don’t matter. I know. They know. Maybe you know. I asked for pickle juice at an aid station. Just a swig. They thought I was crazy and poured me a whole cup. I changed shoes 7 times. Every time I asked Jana if she had seen a confidence plate, one would appear right in right of us. Every. Time. This course was mostly road and when you got to the single track there was so much mud that you wished for the road again. A man named John Gessler finished his 25th Vermont 100 this year. I ate 2 Clif shot bloks with two miles to go. Rocket-fuel? I OD’d on Picky bars. I was worried about getting a funky tan on my forehead from my backwards hat. I made sure Jana put sunscreen there. They warned us about trench foot. Hence the changing of socks and shoes.